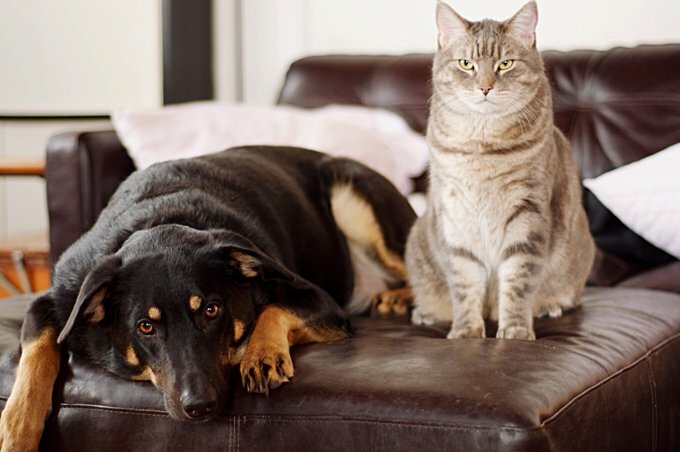 Dog People & Cat People: Are There Really Differences? A strongly opinionated colleague of mine once announced to a roomful of coworkers: “Cat people prefer vanilla, dog people prefer chocolate.” I pointed out that I have two dogs, yet I prefer vanilla. And now this report surfaces and makes headlines on Business Insider, further fueling ugly stereotypes I want no part of. Apparently dog people are more likely to be extroverts, more likely to be conservative, and less likely to enjoy puns. Ha! Are you freakin’ kidding me? Less likely? I’ve got puns of STEEL over here. I’m the pundit-in-chief. The mayor of Punsacola. The great deliverer of all wordplay — the OB/P-U-N, if you will (and even if you won’t). Oh, and get this: According to the report, cat people are more likely to be neurotic. Wrong, wrong, wrong, report! I’m deeply introverted, proudly liberal, and I could out-neurotic a cat person any day of the week, obsessively-washed hands tied behind my back. As if those misconceptions weren’t bad enough, the report goes so far as to suggest that dog people are more likely to cite Paul McCartney as their favorite Beatle. My god! How loud do I have to scream until I’m heard? Paul McCartney is NOT my favorite Beatle. And here’s the thing that really gets me: I like cats, I truly do. But I can’t walk into a room saying that and expect anyone to take me seriously. I’ve been pigeonholed into a very specific role — the dog lover — so no one believes me when I profess to enjoy both. The only people who get away with this are those who have at least one of each species in their home. And they’re met with skepticism, if not outright derision. Yesterday I read a great post by blogger and Pit Bull advocate Emily Douglas. She writes about Denard Robinson, a University of Michigan quarterback who smiles a ton and just generally makes everyone feel good. Emily wants readers to know he’s a darn swell guy. So after I balked and squirmed and made excuses, I swallowed my pride and admitted it. There are moral, decent, kind football players out there. Emily’s point is that I can’t very well go around blanketly maligning pro (or college) athletes and then turn around and expect people to see every dog as an individual. I’m agreeing with her not just because I care about Pit Bulls, but because she’s right. Some stereotyping is more detrimental than others. As faux-angry as I am about being labeled an outgoing, pun-despising Wings lover, I’m real-angry about certain groups of animals (including human animals) getting hit with a rap they don’t deserve. It doesn’t matter whether you love Pit Bulls or football players or cats or dogs or men or women or all of the above. The takeaway is (yep, here comes the lesson), look no further than a reputation and you may miss out on the best thing that’ll never happen to you. I am he as you are he as you are me and we are all together. No?